A member of the Ohio Women's Hall of Fame, Ruth Crawford Seeger, was born in East Liverpool July 3, 1901. Ruth was the daughter of the Reverend and Mrs. Clark Crawford. Rev. Crawford served as minister of the First Methodist Church from 1898 to 1903. Mrs. Seeger was honored by the Hall of Fame for her contributions as a pianist, musicologist and collector of folk music. She was the first woman to receive the Guggenheim Fellowship for music composition in 1930. Music critics said her compositions were astonishingly bold in their experimental perception and in sights. Among her important works, the 1931 "String Quartet" is now considered a masterpiece of the early avant-garde movement. She returned to composition in 1951 and completed her Suite for Wind Quintet" shortly before her death. Mrs. Seeger studied in Florida, New York and Paris. She began her career teaching at the School of Musical Arts in Jacksonville, Florida from 1918 to 1921. Later, she taught at the American Conservatory in Chicago from 1925 to 1929 and at Elmhurst College of Music in Illinois from 1926 to 1929. She was married to Charles Seeger, also a noted musician. During the 1930's they lived in Washington, D.C., where Charles was involved in a federal music project for the Works Progress Administration (WPA). It was at that time that she began her interests in folk music. She edited eight volumes of folk music, several of which are available at the Carnegie Public Library of East Liverpool. She devised methods for teaching children folk songs and dedicated herself to teaching and collecting American folk songs. The Seegers had four children, Michael, Margaret (McCall), Barbara (Singleton) and Penelope (Cohen.) Mrs. Seeger had three stepsons, John Seeger of Connecticut, Charles Louis Seeger of California and Pete Seeger, the noted folk singer. Mrs. Seeger died in 1952 at their home in Maryland. Her husband died in 1978. Ruth Crawford Seeger was elected to the Ohio Women's Hall of Fame in 1980. 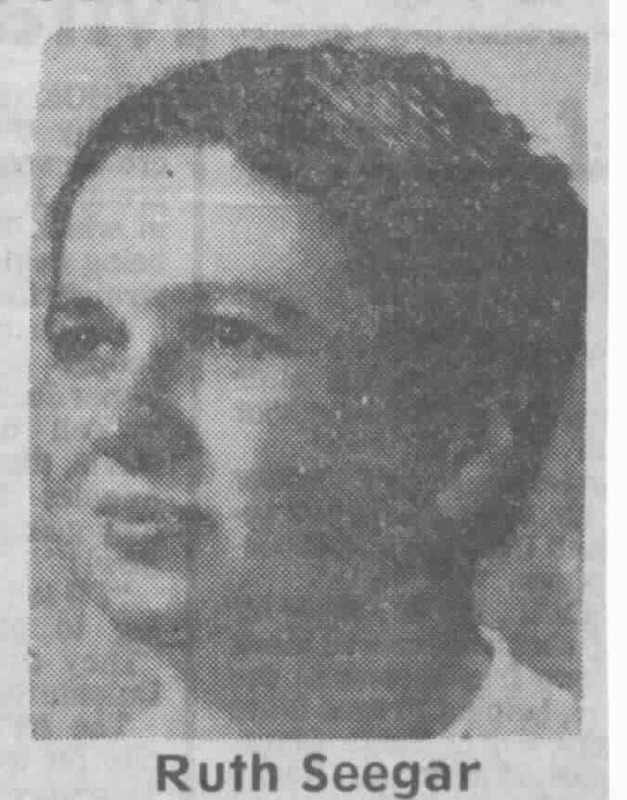 This obituary appeared in a local paper at the time of Ruth Crawford Seeger's death. The paper from which the clipping was taken was not identified. Mrs. Charles Seeger, the former Ruth Crawford of East Liverpool, music composer, folk singer and one of the nation's leading collectors of children's folk songs, died Wednesday at her home in Chevy Chase, Md. She was 52 and the first woman composer to win a Guggenheim Fellowship. One of Mrs. Seeger's books, "Let's Build A Railroad," is scheduled to be published in the spring, and another, "American Fo1k Songs for Christmas," was published two weeks ago. She also wrote "American Folk Songs for Children" and "Animal Folk Songs for Children." Her music included "Rosselty Rosselty," which was performed a year ago by the National Symphony Orchestra at Constitution H a 11 in Washington. She also composed music for piano and instrumental ensembles, including "String Quartet, 1931" and "Suite for Wind Quintet." In addition, she was music editor and arranger for "Our Singing Country" and worked with her husband on musical arrangements for "Folk Songs, USA." She met her husband when he taught her counterpoint in New York. They were married in 1931. Seeger is the retired chief of the music division of the Pan-American Union. She had received many degrees and honors and had several compositions and concert piano performances to her credit. Her son, Michael Seeger, who plays the five-string banjo, and daughter, Margaret Seeger, who plays the guitar, are both folk singers. Also surviving are two other daughters, Barbara and Penelope, and a brother, Carl Crawford of Pasadena, California.